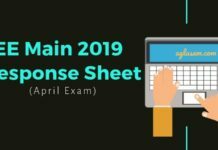 JEE Main 2018 Exam Pattern indicates the question paper pattern of JEE Mains exam. The exam pattern of JEE Main 2018 shows details of the number of questions asked, duration of exam, mode of the exam and other specifications. Candidates who will appear in the exam can know this information and prepare accordingly. Please note that the pattern has changed over the years. Hence, if you are referring to very old JEE question papers, you may find the pattern to be slightly different. JEE Main Exam Pattern 2018 is given below. Candidates can check the detailed JEE Main 2018 Exam Pattern from this page. The exam is held in both online and offline modes. While filling the JEE Main application form 2018, you must select appropriate mode accordingly. If you are interested in only engineering entrance exam, select Paper 1. You can opt for either online or offline mode for Paper 1. If you are interested in only architecture entrance exam, select Paper 2. You can opt for only offline mode for Paper 2. If you are interested in both engineering and architecture entrance exams, select Paper 1 and 2. Now you have two options. Either opt for offline exams for both papers. Or go for CBT mode in Paper 1 and offline mode in Paper 2. Paper 1 Pen and paper based (Offline). Paper 2 Pen and paper based (offline). Both Paper 1 and Paper 2 Pen and paper based for both exams. CBT for Paper 1 and Pen and Paper based for Paper 2. As per latest JEE Main 2018 information, exam pattern 2018 such as question paper, duration of exam details are given below. Details are in accordance with this year question papers. Paper 1 – Exam pattern of JEE Main 2018 Paper 1 for BE / B.Tech is explained. The question paper consists of 90 questions. 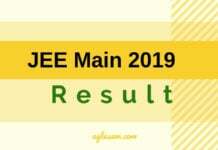 The JEE Main 2018 question paper is expected to consist of 90 questions. The maximum marks are 360. There are three parts in the question paper A, B, C consisting of Physics, Chemistry and Mathematics having 30 questions in each part of equal weightage. Each question is allotted 4 (four) marks for correct response. Candidates will be awarded marks as stated for correct response. 1/4 (one fourth) marks will be deducted for indicating incorrect response of each question. No deduction from the total score will be made if no response is indicated for an item in the answer sheet. There is only one correct response for each question. Filling up more than one response in any question will be treated as wrong response and marks for wrong response will be deducted. 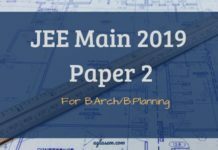 Paper 2 – Exam pattern of JEE Main 2018 Paper 2 for B.Arch / B.Planning (expected) is explained. The question paper consists of three marts – Part I, Part II and Part III. Part I – Aptitude Test has 50 objective type questions consisting of four (4) marks for each correct response. Part II has 30 objective type questions of Mathematics consisting of four (4) marks for each correct response. Mark your answers for these questions in the appropriate space against the number corresponding to the question in the answer sheet placed inside the test booklet. Part III consists of 2 questions carrying 70 marks which are to be attempted on a separate drawing sheet. Marks allotted to each question are written against each question. The Joint Entrance Examination (Main) will have multiple choice questions. Each question is followed by four options, of which only one is correct. Candidate will have to select the correct answer among the options. Negative marking: 1/4 of the total marks allotted to the question allotted is deducted for incorrect answers. Thapar University Admission - Apply Now !! JEE Main 2018 Choice of Language of Question Papers. Candidates applying for JEE Main 2018 can opt for English, Hindi, and other Languages of Question Paper based on the exam centre location, and languages made available by CBSE. Use of Calculator and Communication Aids : Use of electronic devices like mobile phone, calculator etc. is NOT PERMITTED in JEE (Main) – 2018. Materials like log table, book, notebook, etc. should NOT be brought into the examination hall. If you have any queries regarding IIT JEE Main 2018 Exam Pattern, please ask in comments below. What is minimum passing marks required in every subject i.e. P C M.
Is every subject necessay to paas or all over marks will be concerned?